PennDOT has updated the guidelines for the installation of rumble strips. The new material was approved and inserted into the existing Design Manual 2: Chapter 12.12 Rumble Strips. 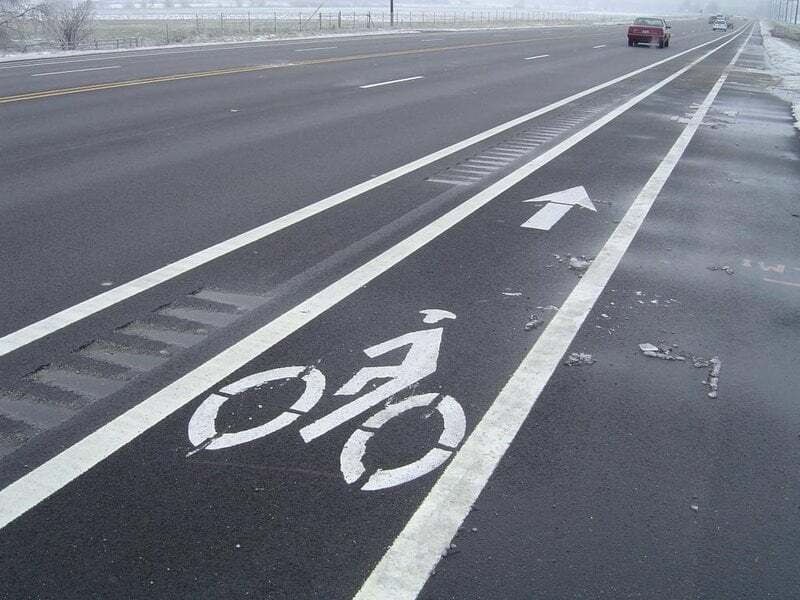 The guidance clarifies where you should place “bicycle tolerable” rumble strips on roads. For bicyclists the “bicycle tolerable” rumble strips are the preferred treatment on most non-interstate roads. These strips are shallower (3/8″ verses 1/2″) and have gaps to allow bicycles to safely transition into the travel lane if needed. Edge line rumble strips are preferred because do not reduce the usable width of the shoulder. 12.12.F. Guidance on Shoulder and Edge Line Rumble Strips (SRS/ERS). SRS are installed 16 in × 7 in × 1/2 in on interstates, freeways and expressways (where bicycles are prohibited), and 16 in × 5 in × 3/8 in on other undivided two- or four-lane roads where bicycles are permitted (see Publication 72M, Roadway Construction Standards, RC22M, Sheets 2 and 3). ERS are placed 8 in × 5 in × 3/8 in. It is preferable to locate ERS so that the edge line runs through the rumble strips. This increases the visibility and durability of the edge line pavement marking. 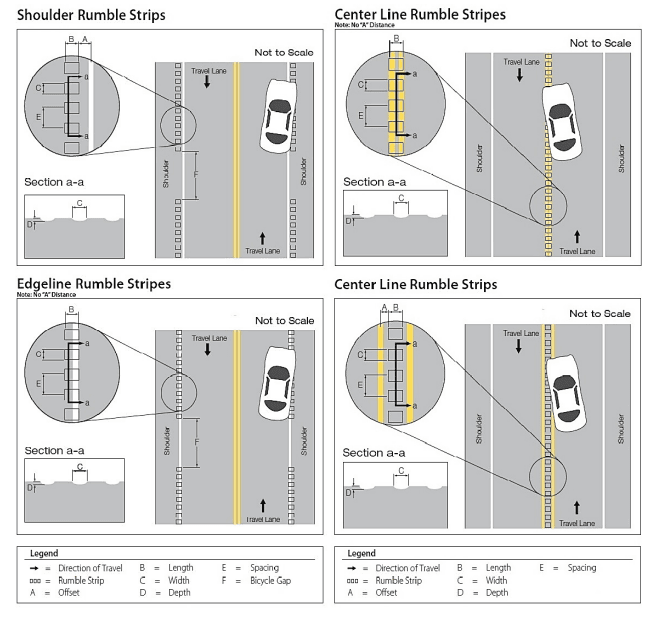 Guidance for Center Line Rumble Strips (CLRS) includes a consideration for the available lane plus shoulder to be 14 feet wide, important because drivers may be reluctant to cross the strips and the center line to safely pass bicyclists. While not perfect the provision at least discourages CLRS from being installed on narrower roads. 12.12.B …As part of multi-modal transportation system planning, consult the District Bike/Ped Coordinator where SRS/ERS are being planned for installation. Concerns may include Bicycle PA routes, other local bike routes, national bike routes, and proposed bike routes from Metropolitan Planning Organizations (MPO)/Rural Planning Organizations (RPO). The guidance does a very good job of encouraging the user to seek internal and public input for Rumble Strip installation. However a District Bike/Ped Coordinator is an additional duty position, bicycle and pedestrian tasks are tacked onto their normal responsibilities, and PennDOT only has one full-time bike ped coordinator who handles issues for the entire state. As the need to address bicycle and pedestrian issues increases, the additional responsibilities will require much more staff time to assure that bicycle and pedestrian elements are given a full and fair review. We continue to encourage PennDOT to consider elevating district coordinators to full time status, starting with District 6 (Philadelphia and its surrounding counties).